Brine, a mixture of water and salt, has been used to tenderize and preserve meats since colonial times. The Food Timeline states some colonial households stored foods in containers filled with cold, salted water. Pork was most often stored in this way to preserve it until it was smoked, as were poultry and game. The brining process causes meats to gain about 20 percent in weight due to the salt and water mixture dissolving protein in muscle tissue and permeating all of the meat. This reduces moisture loss during cooking, making the meat juicier and more flavorful. 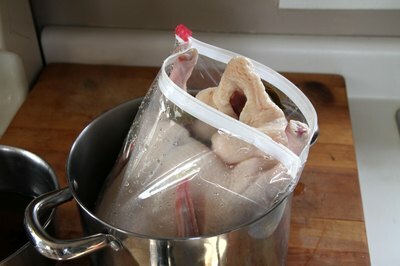 Remove the neck giblets from inside the duck and rinse it inside and out in cold, running water. Set it aside while preparing the brine. Pour the salt into a mixing bowl and add the water, stirring constantly with a spoon until the salt is dissolved. Center the doubled bags in a deep bowl or container and place the duck inside the bags. Carefully pour the salted water over the bagged duck and tightly secure the bags with a wire tie, pressing as much air out of the bags as possible. 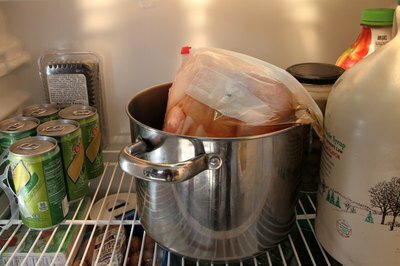 Place the bowl containing the brined duck into the refrigerator and let it chill for one hour per every pound of weight. The duck can be turned once every hour to ensure even soaking. When the duck is finished soaking, rinse it inside and out under cold, running water and dry the skin well with paper towels. This will remove any remaining salt and allow the skin to crisp when cooking. Sugar, molasses, honey or spices may be stirred into the brine mixture with the salt, if desired. Brined meat cooks faster, so use a meat thermometer set into the thickest part of the duck. 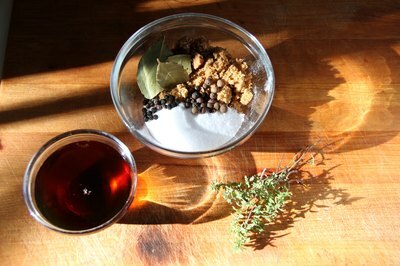 Over-salting the brine or over-soaking the duck will toughen and dry the meat instead of adding moisture and tenderness. What is the Difference in Curing and Brining?